Shoestring Elegance: Quick and Easy Homemade Lemon Curd and Candied Lemon Peel! 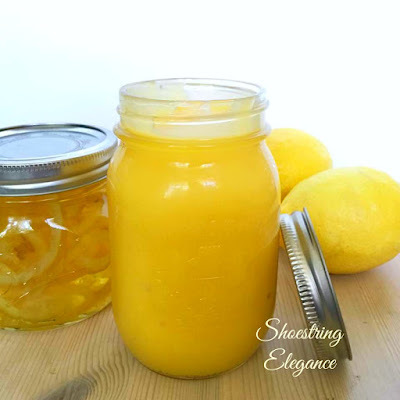 Quick and Easy Homemade Lemon Curd and Candied Lemon Peel! Hi Friends, It has been too long since I've been able to share something of my own with you! 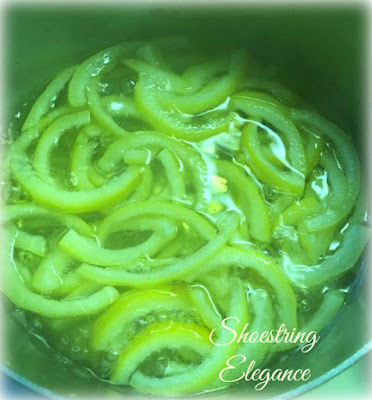 Yesterday, I posted some of these images on Shoestring Elegance's Facebook Page Well, let's just say there was far more interest than I had anticipated in my use of the Lemons that came with my new home. I lost my rose garden when I had to move, but I gained a Lemon tree! I'm, constantly trying to find the silver linings, I guess. Truthfully, to have found any new place in my home town these days is quite a feat, so I am choosing gratitude for all that I am blessed with. Which now includes a Lemon Tree! Which brings me to these images! With the lemons starting to fall and new green ones starting to appear, I felt I better get to using them for something more than the lemon zest in my everyday cooking. Having to have buy lemons, in the past, I haven't had the luxury for a long time to make all the lemony goodness that I could. I decided I better get to work if I were going to be able to enjoy this seasonal abundance. I knew, I definitely wanted to make lemon curd! I love the wonderfully smooth, tangy flavor and it's so versatile! Be it on scones, danish, filled cupcakes or blueberry muffins! All options are delicious, so there's no losing! However, before I began my curd, I realized I didn't want to waste any of the lemons, it's just all so yummy! So, firsts things first! I cut my lemons in half and grabbed every drop of juice they had to give, then I strained the pulp out and set that aside. 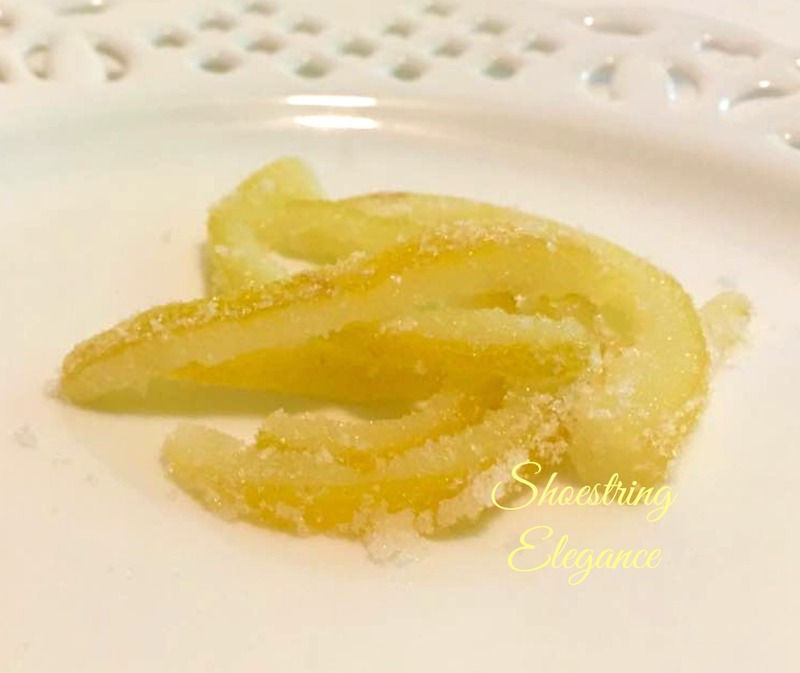 It was time for my Candied Lemon Peel! (Squeals with excitement!) I have loved candied peels forever and they really aren't as difficult to make as most people seem to think. Here is what I did! I put my 1/4 inch (approx.) slices of the lemon peel in 2 cups of fresh water, brought them to a boil, removed them from the heat, drained, removed any pith, the white bittery stuff from them and returned them to the pot and filled with 2 more cups of fresh water and brought that to a boil I repeated this step three time in all. 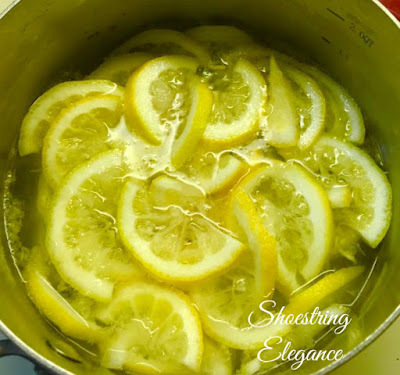 Then, I simply removed my lemon peels and put in my pan 2 cups of water with 2 cups of sugar, bring to a boil, add your lemon peels back into the syrup and turn to a simmer. I let this cook, like that for about another half hour, so the peels are almost translucent. At this point there done! You can drain the all and dry them and roll them in sugar and be finished! But, if you are anything like me you make far more than you can enjoy immediately. So I took out several slices to enjoy and rolled them in sugar. :) YUM! They end up looking like this! As for the rest, I like them to stay as fresh tasting as possible so I choose to save the rest of the peels in their syrup in Mason Jar. This way when I want to use them in the future, I just have to fish a few out, dry them and roll them in the sugar and enjoy! These are also great for decorating! So Candied Lemon Peels done! Now, I can get onto my Fresh Homemade Lemon Curd! I wish I had taken more pictures of the process of the Lemon Curd, but it's really so easy I'm just going to share my recipe and technique with you. 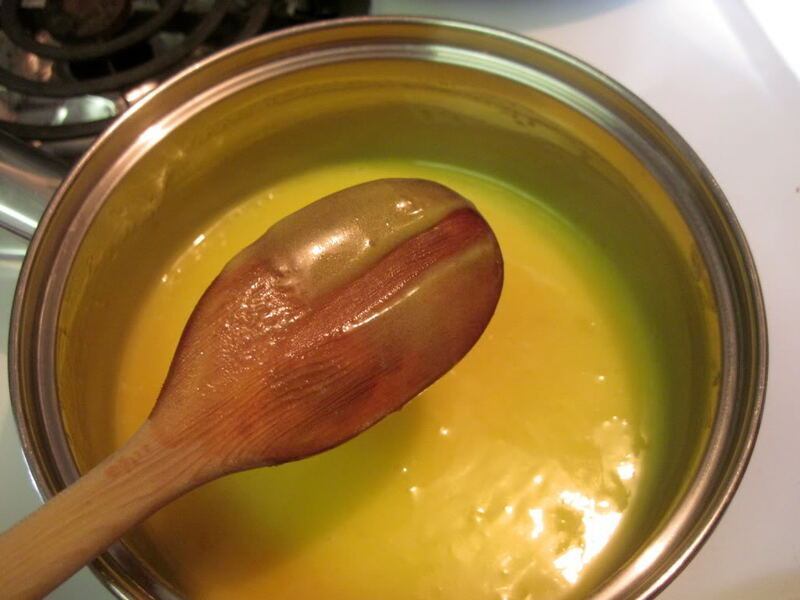 There are a bunch of different theories and recipes for lemon curd this one is just the way I make it. Please feel free to google it, there may be one more to your liking This one fits the bill for my tastes. Whisk your eggs and yolks with the sugar, add your lemon zest and juice in a stainless steel bowl that you can easily place over a pot of simmering water. When your water starts to simmer, place a bowl over, not touching the water but over. Stir, stir, and stir. You are going to keep at this for several minutes until you can run your finger across the back of a spoon and it stays separated. Something like this.. When you get to this point remove your curd from the heat and add your 4 tablespoons of cold, cubed unsalted butter. It's important to save your cold butter until the end because the cold will stop the curd from cooking more. Stir in and watch the beauty come to life. It really is a wonderful thing. Run entire mixture through a sieve to remove any clumps and you're left with your own beautiful Lemon Curd! I hope you enjoy this as much as my family and I do. Thanks so much for all your interest and continuing on my journey with me. Want to save this recipe?! Use the Green easy Printer friendly button at the bottom of the page! Sharing this with some beautiful friend! 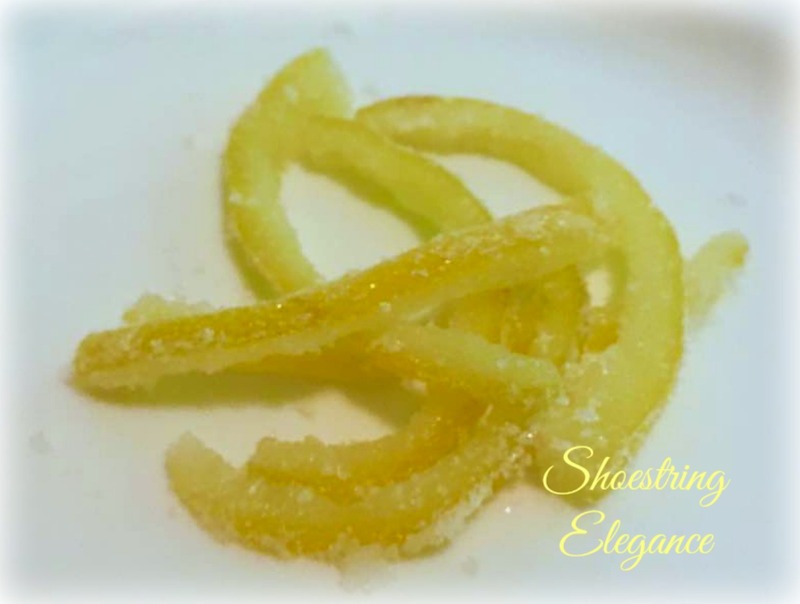 I've never had candied lemon peels, but they sound delicious. Your lemon curd looks great, too. 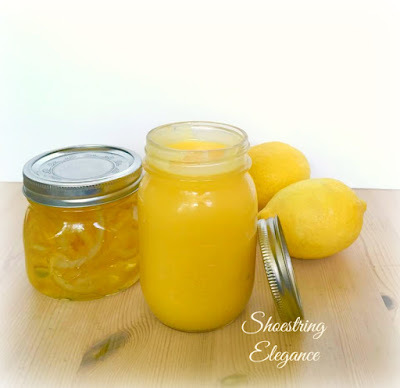 Your Lemon Curd looks delicious, I can't wait to try this recipe. Hope you have a fantastic weekend and thanks so much for sharing your awesome post with us here at Full Plate Thursday. We hope to see you again real soon. Linda, you'd be amazed how easy it is. Give it a try! Thank you for your wonderful comment, my friend! Happy Weekend! There is always a positive Theresa and I'm glad you've been able to turn your lemons into something lovely. Thank you for sharing at Create, Bake, Grow & Gather this week. I'm delighted to be featuring these recipes at tonight's party and pinning too!! Thank you so much, Kerryanne! I'm thrilled that you liked them. What a great surprise! This looks so good and easy too! Thank you, Cindy! I was so excited to join your beautiful AMAZE ME MONDAY part! I love lemon curd and this looks delicious. Thanks for sharing it with us at the Waste Not Wednesday link party. Keep coming back and linking each week. This sounds wonderful, I'll have to give it a try. Thanks for sharing.